Pottery Corner is holding another late night Pots and Pamper evening for those who fancy doing something a little bit different on an evening. 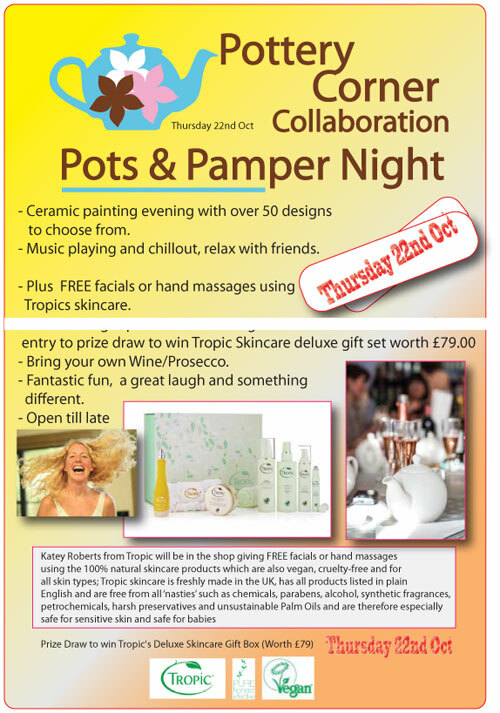 Pottery Corner is holding a late night Pots and Pamper evening for those who fancy doing something a little bit different on an evening. Choose your items from a selection of over 50, they have the glazes, brushes and the know how and the evening is yours to be creative on and actual ceramic. Their ceramics range from simple tiles at £6 to Italian bowls at £30. plus lots of fantastic item in-between, such as mug,s tea lights, plates, vase and baubles, simply pick what you want. Feel free to bring some wine or nibbles they have the glasses at the ready. With music playing in the back ground tea/coffee and cake being served it can really be a relaxing night. Especially when we have the fantastic Katie from Tropics organic skin care. Katie will be giving FREE facial and hand massages whilst you paint. FREE to members all you have to pay for is the ceramic you choose to paint and nurture on the night.